The SharePoint Community generally agrees that the platform suffers significantly from two issues. With over 55 SharePoint Portals and Intranets to support, conventional training wasn't working for us either. We needed to understand the root cause and find a solution. Cost: High costs cause the "train the trainer" model where few employees are directly trained. Low Retention: As much as 90% is forgotten in just 30 days! iAssist: A dedicated training Site inside the Site Collection, providing an Automated Training and Support Solution for SharePoint, featuring “bite sized” video training segments in an expandable media library. Professionally scripted, directed and produced. Watched in sequence it’s a training curriculum. Watched when searched for it’s a help desk. 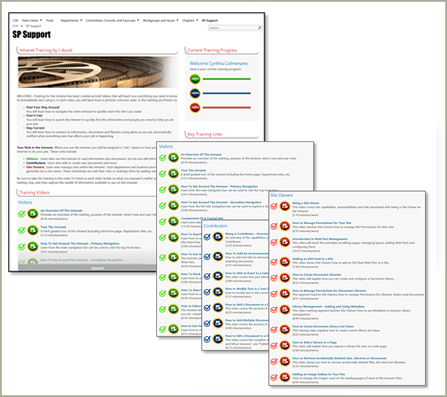 IAssist also includes: User Analytics, a Support Discussion Board, Training Evaluations. And surprisingly it's 80% less than instructor led training, so you can afford to train EVERYONE! Training & Help Desk costs reduced. JFD offers both Standard "Best Practices" versions and Custom Versions (recorded in your Intranet environment). Attend a webinar, ask for a demonstration or contact us to learn more. Interested in seeing a demonstration? Just use the link below to schedule a conversation. We think you'll find that the iAssist solution provides a phenomenal return on investment.